Even on a bitterly cold morning like this, birds on the grounds of Harvard University are making a ruckus. Even through the thick stone walls and narrow windows of the basement offices of the Museum of Comparative Zoology, squawks and chirps are clearly audible. In the main room of the museum's ornithology collection, however, the birds are much quieter. "Each specimen has a story to tell," said Scott Edwards, Alexander Agassiz Professor of Organismic and Evolutionary Biology at Harvard and curator of the Ornithology collection. "Where it comes from, and what kind of environment it lived in." He pulled out a long, shallow drawer in the musty main room, revealing rows of bright red Pine Grosbeaks, one of many species preserved at room temperature in the museum's large collection. Skin, skeleton, and nest specimens are also preserved, and the collection hosts birds from every genus. There are even historic specimens collected by explorers Lewis and Clark and pheasants once owned by George Washington. "My career has always had a museum component to it," Edwards said. "It's an old-fashioned collection, but some of the specimens are from populations that are difficult to find." Edwards is certainly familiar with tracking down exotic species. He has led student trips to Mongolia, Panama, and Australia, where they have collected several original specimens. On one trip to Panama his students managed to record the call of a local mockingbird that had never been recorded before. "A neighbor in New York took me bird watching once, and I somehow just got hooked," said Edwards, who grew up in Riverdale, Bronx. "It was thrilling to see what you thought was a rare species, and be able to link something in your backyard to a field guide—Riverdale has a long history of ornithology, and New York is amazing for wildlife." After those sixth grade excursions, however, Edwards didn't really think about bird watching as a career. He studied history of science at Harvard, but took a year off after sophomore year to work at the Smithsonian Museum of Natural History in Washington, D.C., and gain field experience in Hawaii and California. When he returned to college he switched to biology and began to study mammalian genetics. Evolutionary biology eventually led him back to birds, and he has since conducted research with his students on topics ranging from immunogenetics to the accumulation of organic mercury in albatross feathers. He loves seeing his students get published, and encourages them to pursue varied careers in biology. "I think a lot of parents are agonizing over whether college is worth it, but getting involved in a professor's research is a priceless opportunity," he said. 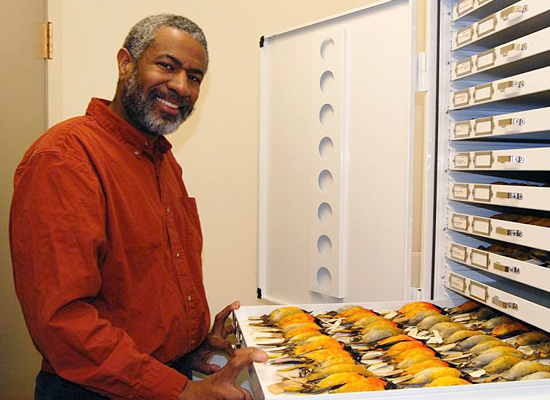 Edwards, who received funding from the National Science Foundation to bring minority undergraduates to meetings of the Society for the Study of Evolution, says he is always on the lookout for promising students. "A lot of students don't apply to the best schools," he said. "Harvard has challenges recruiting minority students." Edwards would like to see legions of students in the field, and takes pride in encouraging his own graduate students to pursue research in evolutionary biology. For now, maintaining Harvard's collection is a demanding position. Although the dry storage it not intended to efficiently preserve genetic material, Edwards does get requests for skin samples from the birds. He says that although the DNA might be somewhat degraded, it can still be useful for some research, such as testing what kinds of pollution a specimen came in contact with in the wild. According to Edwards, museums are also valuable for educating the public about science and exposing them to cutting edge research technologies. He encourages AAAS members to visit the museum, which includes collections of everything from fossilized insects to mammals. Of course, you don't need a museum in order to enjoy birds. "It's always a thrill to find a species you're looking for, and to find out how little is known of that species," Edwards said.